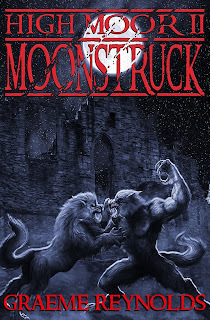 As promised, an update on the new novel by Graeme Reynolds, High Moor II - Moonstruck, which is close to be publication. 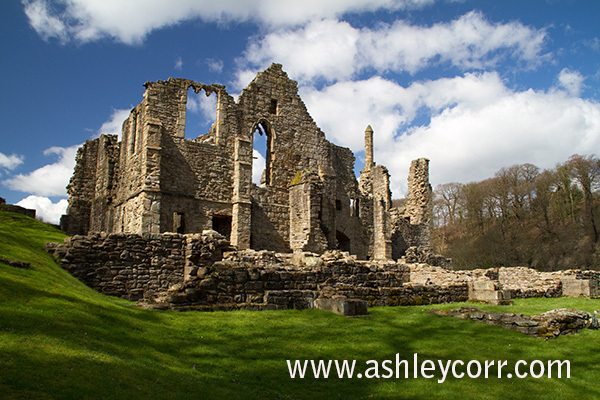 It features an image of mine on the front cover, of Finchale Abbey, County Durham, which is a ten minute drive from AC Towers. An earlier blog entry touches on the initial contact from Graeme and his illustrator, Stu Smith, but if you missed it, here it is. 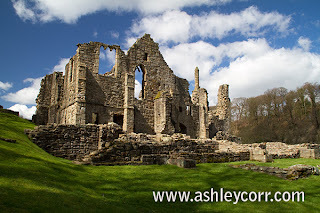 When Graeme first approached me regarding my photo of Finchale Abbey (shown below), I wondered how a colourful picture postcard shot would look on the cover of a Horror novel, especially if it followed the theme of the first book, High Moor. Stu Smith got it just right, and although there's a huge difference between my raw image and the reworked version that apperas as a backdrop on the High Moor II cover, the alerations work very well, in my opinion. 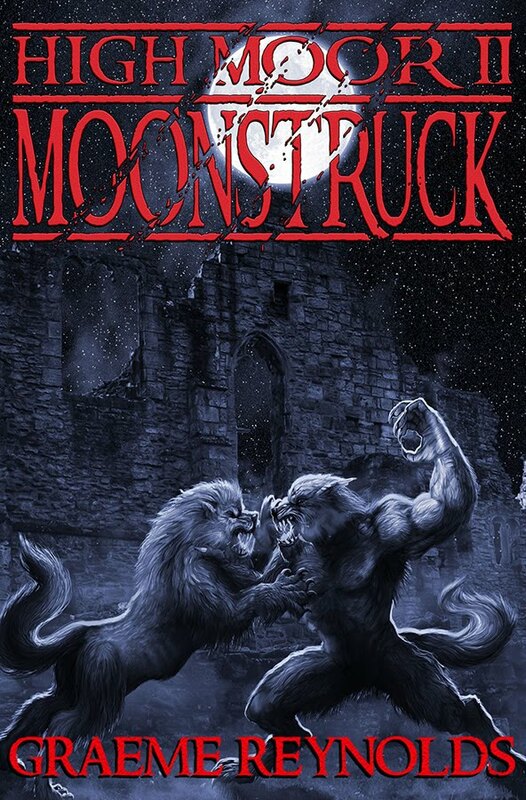 The story is set in Finchale Abbey, and as you can see by the cover, bad things happen here! Graeme and the publishers are aiming for a February or March 2013 release date, so I'll update you as and when I get more news on that. That's all for now. I've got more new photo's to share, on my blog page via the website, www.ashleycorr.com, so don't go far from your Internet connection - I'll be back soon with those shortly. Until then, enjoy what's left of your Christmas/New Year holiday, but if you're already back to the grind, never mind (he he he). Welcome to my first blog entry of 2013, and a Happy New Year to everyone! With the new year just a few hours old I was out and about once again with the trusty Canon 7D, heading south down the A19 towards Stockton-On-Tees, home to the Infinity Bridge. I don't know what it is about illuminated bridges that draws me in, as I've photographed quite a few nearer home, in particular the array of bridges along Newcastle Quayside. For some time now I've dedicated a lot of my 'Camera Time' to low-light photography, mainly at dusk, but also at dawn, when I'm often in pursuit of that dramatic sunrise shot. When I recently noticed the Infinity Bridge on a local news bulletin, I made a mental note of it and added it to my 'Places to visit' in 2013, although I never imagined I'd be making that visit on January 1st. So what better way to begin a new year of photography than adding more low-light shots to my collection - no doubt this will be my first of many visits to this location, of that I'm sure. following construction work that started in June 2007. 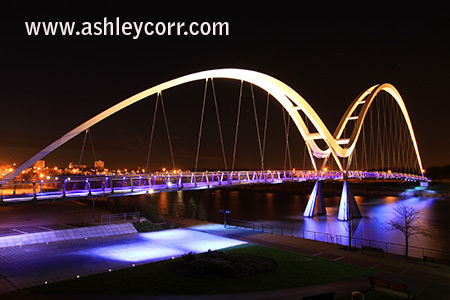 It is a public pedestrian and cycle footbridge across the River Tees in the borough of Stockton-on-Tees in the north east of England. 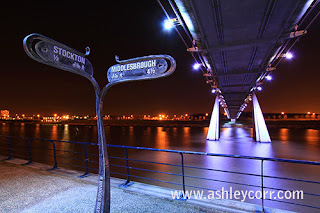 The bridge is situated one kilometre downriver of Stockton town centre, between the Princess of Wales Bridge and the Tees Barrage and it links the Teesdale Business Park and the University of Durham's Queen's Campus in Thornaby-on-Tees on the south bank of the Tees. 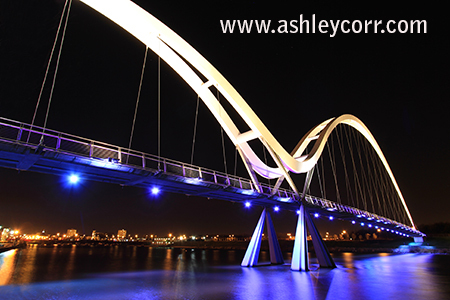 The bridge is a dual, tied arch bridge or bowstring bridge. 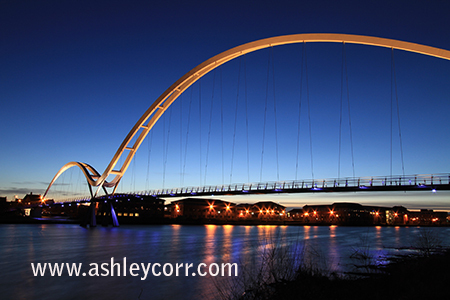 It has a pair of continuous, differently-sized structural steel arches with suspended precast concrete decking. The bridge deck is 5 m wide and 4 m between its handrails. 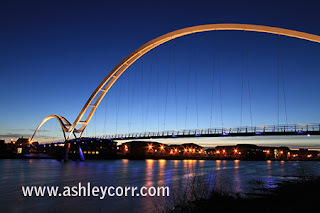 The main arch of the bridge is 120 m long, weighing 300 tonnes, 32 m tall with its top 40 m above the Tees and the short arch is 60 m long and 16 m tall. The hangers (droppers) are spaced 7.5 m apart and are made from 30 mm diameter high strength locked coil steel cable. The tie cables are 90 mm diameter on the large arch and 65 mm on the smaller. A special feature is made of the way the bridge is lit at night. The bridge handrail and footway are lit with custom made blue and white LED lighting built into the handrail that changes colour as users cross. 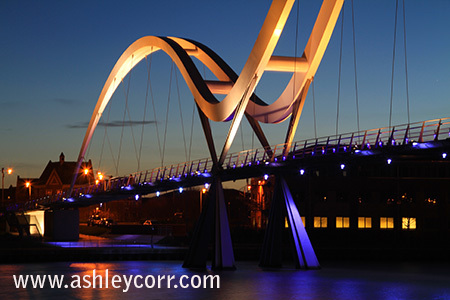 Attached to the steel cable ties are white metal-halide up-lighters to illuminate the white painted bridge arches, and blue LED down-lighters to illuminate the water and ground surfaces immediately below the deck. At night from certain viewing angles when the river surface is flat calm, the twin arches together with their reflection in the river appear as an infinity symbol ∞, and it is this effect that inspired its name. Following the SatNav, I arrived at the bridge after a thirty minute journey, steady away from Houghton le Spring. The light was falling quickly so I got to work straight away, shooting from the top of a staircase, across the water, with the Infinity Bridge slightly over to my left. It was a great angle to shoot from. I fired off a few frames before making my way onto the bridge and making the short walk across to the other side of the River Tees, where I took more shots, this time with the last colours on the horizon directly in front of me, looking West. The river was flowing quickly, with the tide heading out, so there was no chance of any still water reflections tonight. Maybe another time. I headed back across the bridge, struggling to keep a grip on my tripod due to the fact that my fingers were about to drop off. It was effing freezing! But I was almost done, so I made my way back across the water and once again took up position on the staircase where I originally photographed the Infinity Bridge. The sky was much darker by this time and it looked much better as a backdrop, which you can see here (shots 3 & 5). Click an image to reveal a larger version. And that was that. Another outing that yielded some good shots. I was glad to get back in the car to be honest. The heated seats were on full throttle and I out of there in no time. Job done.